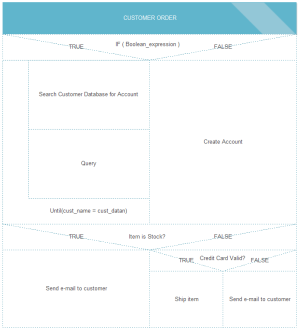 Creating NS diagram with free templates and examples. NS diagram has never been easier. A Nassi-Shneiderman diagram (NSD) is also called aka, NS diagram or structogram. It was first created in 1972 by Isaac Nassi and Ben Shneiderman who were then both graduate students at SUNY-Stony Brook. Nassi-Shneiderman diagrams are used to outline structured programs. Nassi-Shneiderman (N-S) Diagrams are "structured flow charts" drawn as boxes-within-boxes. The main purpose of a Nassi-Shneiderman diagram is to create a logical structure or a blueprint for the program. Through Edraw, you can build a NS (Nassi-Shneiderman) diagram easily. You can simply drag and use a pre-made template and add your information, no need to draw complicated table lines. 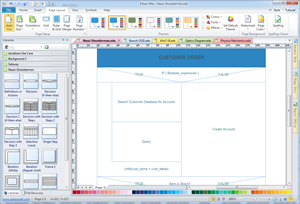 Edraw is designed with a group of automated tools, which help you easily format the diagram. You can use a nice-looking pre-defined theme with one click, or you can customize your drawing through the color, size and line setting. The diagram can be exported to PDF or other graphic formats with a single click. Edraw software offers you plenty of special shapes and symbols used in Nassi-Shneiderman, definitions or actions, decision with step 3, selection, single step, iteration (while), iteration (repeat-until), frame, procedure steps, multiple steps, 2-D word balloon, etc. You can download this ns diagram template on the left anytime and use it to speed up your work.